2009 is Brasch year. 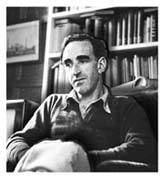 Charles Orwell Brasch was born in Dunedin on 27 July 1909. He was educated at Waitaki Boys' High School and St John's College, Oxford. He lived abroad for many years working as a teacher in England, as an archaeologist in Egypt, and as a civil servant in wartime London. He returned to New Zealand in 1946 and a year later founded Landfall, New Zealand's premier literary magazine. He was a patron of the arts, offering support and encouragement to many artists and writers. He was also a fine poet, producing six volumes of verse, translating volumes of Russian, German and Indian poetry, and writing a memoir, published posthumously in 1980 as Indirections: A Memoir 1909-1947. He died 20 May 1973. To achieve his literary output, Brasch read. His library of 7,500 volumes is housed at Special Collections, University of Otago Library. This exhibition on the 100th anniversary of his birth celebrates his life through what he read. The documenting of an individual's reading habits is never easy; sometimes it is impossible. However, by utilising Brasch's memoir and his journals, which have been recently transcribed, it has been possible to track what books he read and when. Books were re-read; books were not finished; books were praised; and of course there was always the critical eye. Of his entire library, only a small selection of what he actually read is on display. They include early readings such as An Anthology of Modern Verse (1923) and Rudyard Kipling's The Jungle Book (1899); Oxford books such as Oscar Wilde's Salome and Ezra Pound's Exultations (1909); the pre- and post War readings such as Georges Bernanos's The Diary of a Country Priest (1937), James Courage's One House (1933), Rainer Maria Rilke's Letters to a Young Poet (1943), and Eric Gill's Autobiography (1940), and materials read while editor of Landfall such as The Autobiography of Leigh Hunt (1948), Archibald Baxter's We Will Not Cease (1939), Nicolas Berdyaev's Dream and Reality (1950), David Ballantyne's The Cunninghams (1950), and Lady Barker's Station Life in New Zealand. (1950). There are also his favourites: Shakespeare, Dante, W. B. Yeats, and Robert Graves. Selective as it is, the exhibition highlights the reading life of a remarkable New Zealander. Many of Brasch's books represent what was current and fashionable at the time. Everybody read them; everybody discussed their merits. Remembrance and re-evaluation is a good thing, and the title list below forms a handy cultural checklist prompting the question: 'Have I read that?' It is hoped that Brasch's reading will prompt more.